A great focal fabric and row-by-row piecing will create a quick gift to have on hand. 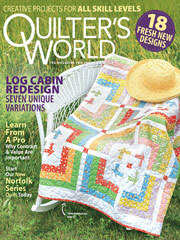 This e-pattern was originally published in the Winter 2013 issue of Quilter's World magazine. Size: 36" x 48". Block Size: 6" x 6" finished.